"CarpetProfessor.com -The Best Kept Advertising Secret in the Retail Carpet Business"
I created this useful Carpet Shopping Form to help homeowners make wise and informed Carpet choices, Avoid Carpet Scams, Save money and Avoid costly retail Carpet buying mistakes. To Buying New Carpet wisely. Also...Get up to $100 off New Carpet! Print & Use My Coupon! Q. What Grade of Carpet Should I Buy? Take Alan's free Carpet Foot Traffic Test to find out! Q. How Much Does Carpet Cost? 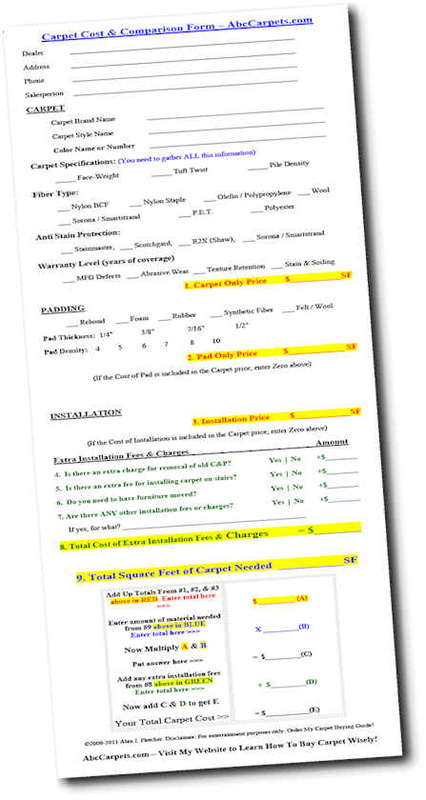 Check out Alan's Basic Carpet Cost Guideline page. Q. Where Should I Buy Carpet? 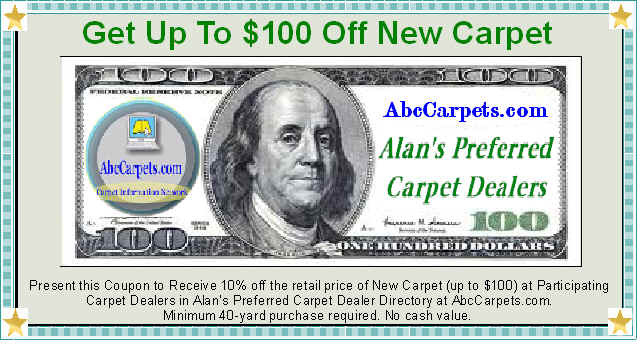 Visit Alan's Preferred Carpet Dealer Directory to see who I recommend near you! AbcCarpets.com Homepage Disclaimer ©Alan Fletcher - All Rights Reserved.